We visit Fort Massac several times a year. Aside from being a wonderful place every day, reenactments are held throughout the year depicting life and often the brutal fighting that was part of early America. There is a fabulous visitor center with a short film about the history of the fort and it's prominence in Illinois history. There are camping sites and several playgrounds in the wooded areas surrounding the fort and a breathtaking view of the Ohio River. A picnic lunch and a little imagination makes this a great rest stop on any tor of southern Illinois. Greetings! I think that this Fort looks amazing. Thanks for taking the time out and sharing with us this cool information about your adventures. I wish you good luck and I am hoping the same coolant works from you in future. If you need any paper help - professionals at www.custom-paper-writing.org may help you at any suitable time. You may check it even now! Visiting this blog was useful for me! Keep sharing your articles! Fort Massac is very beautiful place, I've been there! Only good memories. Thank your for your post! Check our essay on time writing service if you need help with your essays! The Fort Massac is so wonderful was made a State Park in 1908, the first Illinois state park. An old reproduction Fort has been assembled. Every fall, reenactors accumulate for the Fort. I was wondering to read this article! It is valuable to attain a profitable leads and absolutely improved the skills. In present day age, terrorist are obliterating our instructive frameworks and killing our skilled understudies who's are the fate of our nation. On online essay writer on top-writers-reviews.com have high level associations and scholars are uprooting terrorism slowly. What a great picture of Fort Massac! 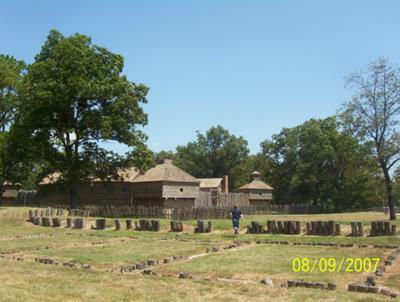 Thanks for sending such a great picture of Fort Massac and for sharing! I just wanted to add also that the next encampment event at Fort Massac is coming up soon. It will be on the weekend of October 18th and 19th, 2008. Join in and write your own page! It's easy to do. How? Simply click here to return to Illinois Geography.